So Dennis has been relatively menace-free lately. Although I hesitate to publicly announce that for fear of any unwanted repercussions. But...I shall take my chances. Anyway... I think he has been conducting secret mentoring sessions with Q. I believe he knows his time has passed, his season is through and it is time to move on. And so he has given the tricks of the trade to the younger generation to carry on. And instead of getting into mischief himself, he has been occupying himself with trying to be bigger and older than his age, resulting in him saying the durndest things. For example, I was giving him a once over before we headed to preschool and said, "You have egg on your face." Without batting an eyelash and serious as can be, he replied, "Oh, I'm a big disgrace" and ran to wash up. We apparently love Queen around our house and lovingly bat that phrase around when anything happens to be on someone's face. Then the other night I was relaxing on the couch and he was measuring me with the measuring tape. He measured my large feet and proudly told me they were 80 pounds long. Woooheeee, I knew my feet were big, but MAN, that's gimongous! One day he placed a cup of water in the freezer to make ice and asked a few minutes later, "Is it frozen salad (solid) yet"? I don't know why, but that one gets me every single time. "Mom, will you help me find the other piece to my harmonica?" I responded with, "Yep, just a minute, let me finish this one thing." "Pleeeeaaase Mom, I'll give you a quarter!" I don't think he even owned a quarter at that particular time. I just think it's a hoot since that's obviously what I'm always tempting him with. Little parrot. He also recently got a watch at a yard sale and wears it everywhere. I mean everywhere. He panics if you try to help him with the dangling strap for fear you will remove it. And we LOVE asking him the time because it is inevitably around 8:32 or 2:34. He thinks he is the hottest stuff since Tabasco. I was busy editing the other day in the early morn..trying to get a good start, when I heard a loud crackling sound. 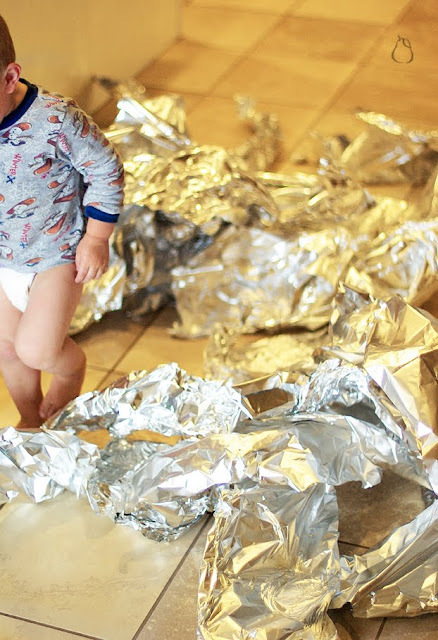 I ran to find Q pulling out wax paper as fast as possible. I got the box away and left him with what he had already unrolled to continue playing with. For the next few minutes I heard the same crackling sounds and chalked it up to crunching and stepping on wax paper. But then it started sounding louder and more, well....metallic. 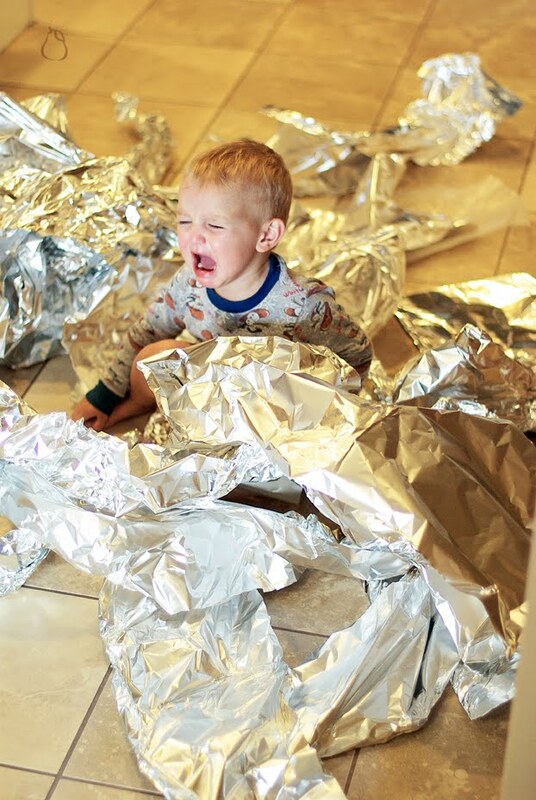 I ran again just to double check and he had the tin foil this time, and I swear when he saw me, he unrolled it faster, like he knew his fun was coming to a quick and immediate end and he may as well get any remaining enjoyment out of it. Arrrrgh. I have to admit though, it does sound so delightful and looks so mesmerizing coming off the roll in sheets and sheets...I guess I can't really blame the tyke. Plus, it was eversofun to wade through. Our very own sea of tin foil. Try it if you don't believe me. Dennis and I were quite smitten with the stuff. I wanted to get a picture of him sitting in the pile to show some size reference, but it apparently really irritated him. You never know. Anyway, we rolled it into two huuuuge balls of tin foil after we had fully walked and crunched through it so we could show the rest of the fam the proof. Then the other day he managed to fish out a yogurt container from the trash with maybe 1/4 of the yogurt left in the bottom. Somehow that tiny bit of yogurt ended up all over his face, arms and shirt...smeared across four separate walls in four separate rooms, finger painted on the floor in various and assorted areas and hand printed up the stairs. I wish food would go that far after grocery shopping. I am super excited to see what other menacing tricks Dennis has passed on to the cute, but eternally busy Q. The other day my nephew was over and wanted to help us do the dishes, so Brian got him a step stool and we put him in between us while I washed and Caleb helped Brian dry the dishes. After I was done, I turned the disposal on. Caleb immediately reached his hand down toward the disposal. I quickly pulled his hand back, turned off the disposal and Brian and I launched into a vigorous explanation to this little 3 year old as to how harmful a disposal could be. I likened it to several knives spinning rapidly around and that they could cut his hand off if he put it in there. To which he replied, "Like Ammon?" Can you BELIVE THAT?! These kids are smarter than the kids of my generation, I swear. I love the look of determination that Q has while working away. I thouroughly beleive that "getting caught" is the funnest part of being mischevious. R will squeal with such delight whenever he sees me coming. This age is fun, but definitely busy! wow i laughed so outload i probably woke my neighbors up. i'm sitting here thinking..hmmm ahs has been this queit, dainty little girl that i don't htink has ever broken a toy or ripped a book in her life and now i have lucan...what will he be like??? and i'm thinking a dennis for sure, great!! but my questino to you is do you get mad and freak out, or do you just do a lot of laughing? What a great snapshot in his toddlerhood...and those brothers sound like they are going to be blood brothers 'til the end. I love the thought of him finger painting with the yogurt...and Dennis really does seem to be such a big boy now. Hopefully no broken body parts this summer though, right! 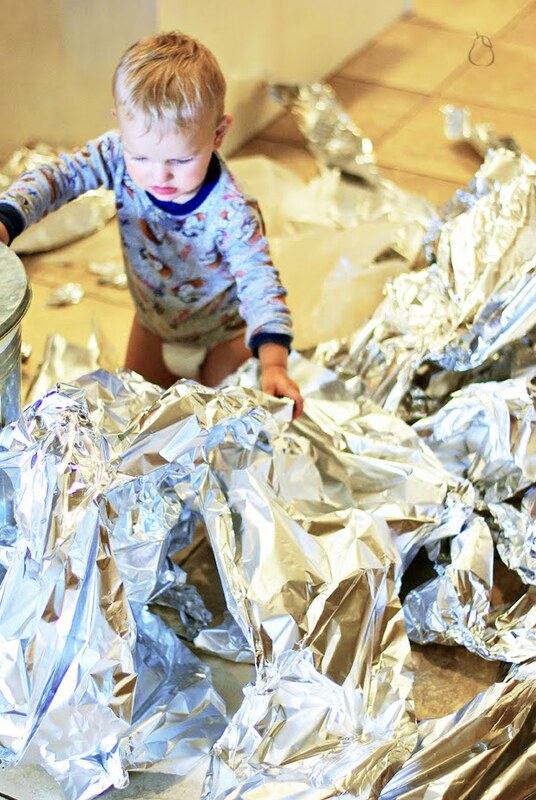 I'm really tempted to go pull out my tin foil!